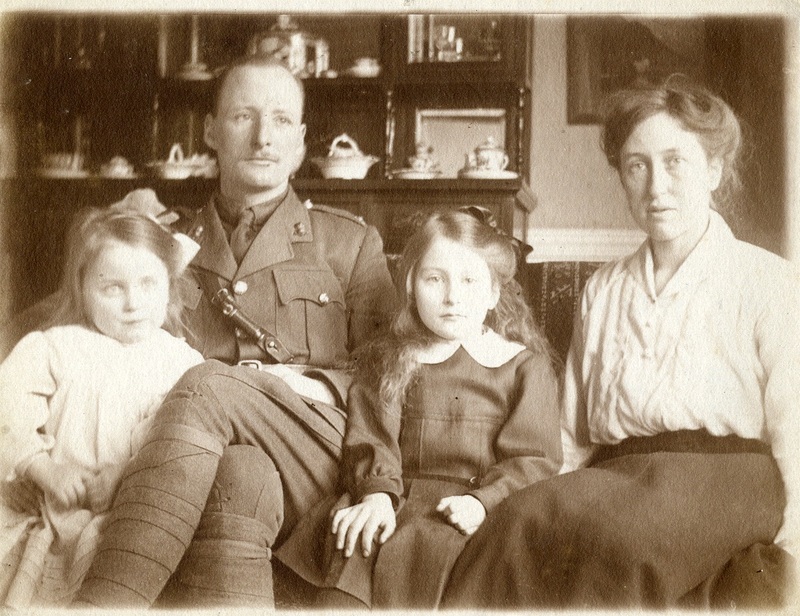 The Batstone family, as mentioned in this post, kept the majority of their letters and many diaries, which give a great insight into how one family dealt with the war. They had two young children when Walter was called up, and in this week in June 1916 he was away training whilst Maree tried to handle things at home. Maree Batstone only wrote one diary entry this week, which started with her receiving two letters from her husband Walter in the morning and afternoon posts. Walter was training in Edinburgh, based in Bruntsfield School, and in his letter explained that he had “been re-drafted + Am now in the 9th draft (when last I sw you I was in the 7th). Dye & I & abot 12 men are on the board tonight as drafted with the 9th draft, isn’t it amusing. I am afraid I have this job at any rate tomorrow – I shall be glad when it is over”. According to Maree’s diary, the “job” was that of Orderly Corporal – meaning long days, Walter even includes a schedule of his day for her, starting at 4.45am. At 5.30am he had to do the rounds to ask is anyone was going sick and take details, at 6am they had to attend at Gillespie School with a list of defaulters (this is James Gillespie’s School, which is 5- 10 minutes walk away). By 7am he was making out sick reports in triplicate and breakfast was at 7.45am. Lights out were at 10.15pm, after a day of sorting mail and other duties – “you are always on duty and liable to provide men for any emergency – today, two men to fetch beer for the sergeants mess”. The rest of Maree’s day revolved around cycling into town to get Devonshire cream for her Aunt Emily’s birthday, shopping for her mother, and trying to put the children to bed early – slightly disturbed by a visitor coming after they had been bathed. 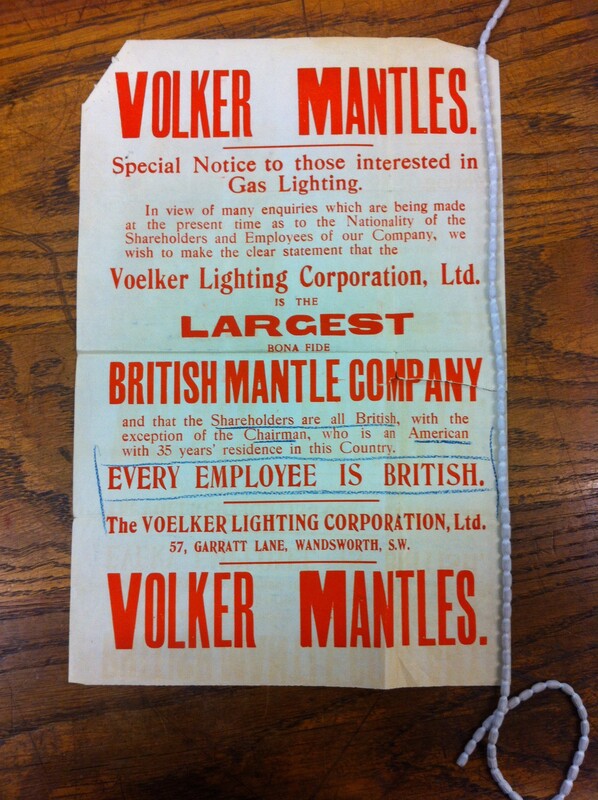 We recently discovered a poster in our collections for the Volker Gas Mantle Works. It doesn’t date from this week in 1916, instead it is probably from earlier in the year or possibly even 1915, but as it was a recent find and this week was otherwise fairly quiet in the borough, we thought we would look at this company and what we can find about them. 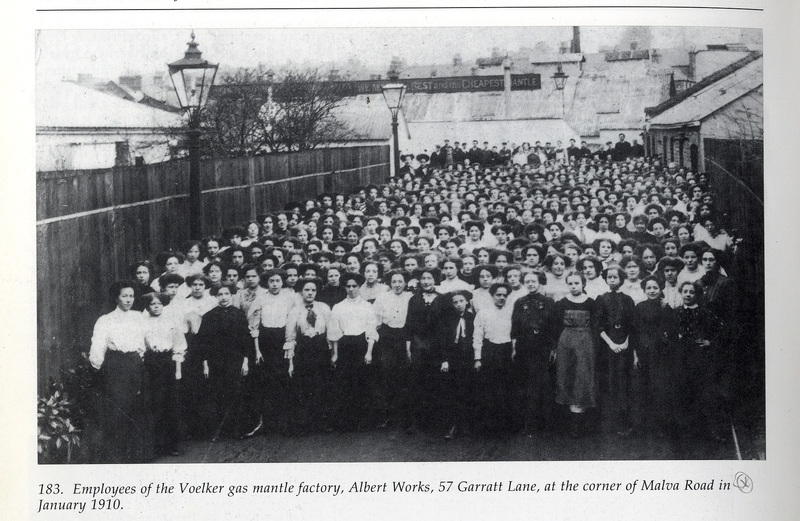 The Voelker Lighting Corporation opened a factory on Garratt Lane in 1895, making incandescent mantles. Records at the National Archives suggest that the firm was dissolved before 1916, although this presumably just refers to the change of name. Volker are listed in the street directories until 1925, then became Lighting Trades Ltd – although still gas mantle manufacturers. The name change took place between the 1914/15 and the 1916/17 directories. 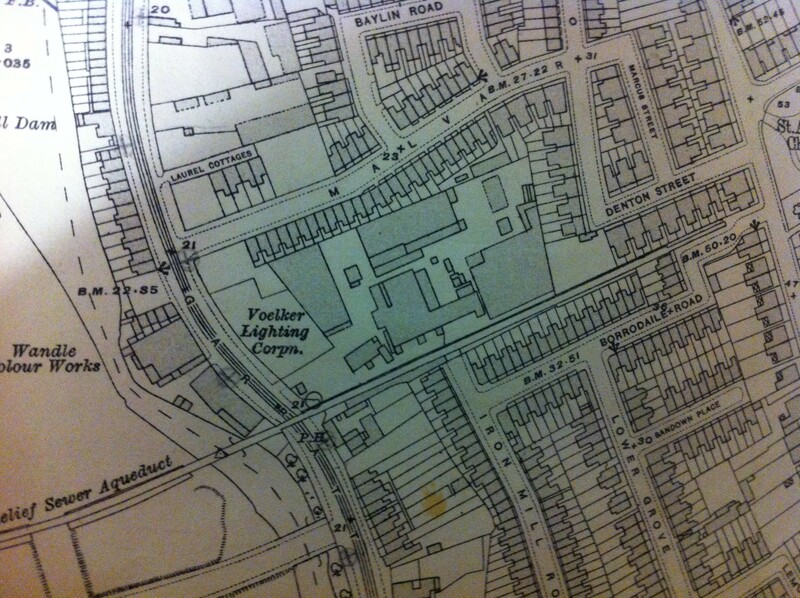 In search of more information about the company, we checked our drainage plans for their building at 57 Garratt Lane and found one from September 1914, where issues over their German name had clearly already arisen as there is a note – presumably requested during the application process, as it is dated October 1914 – at the end of the plans listing shareholders. It lists the directors, (Messrs: Asten of Surbiton; Mardon of Shaftesbury Avenue; Bowden of 121 The Grove, Wandsworth; Garland of 93 Pulborough Road, Wandsworth), and goes on to be explicit that all bar one of the shareholders are residents of the UK. The only one who wasn’t was an American lawyer called Kellogg, who owned 7000 shares. 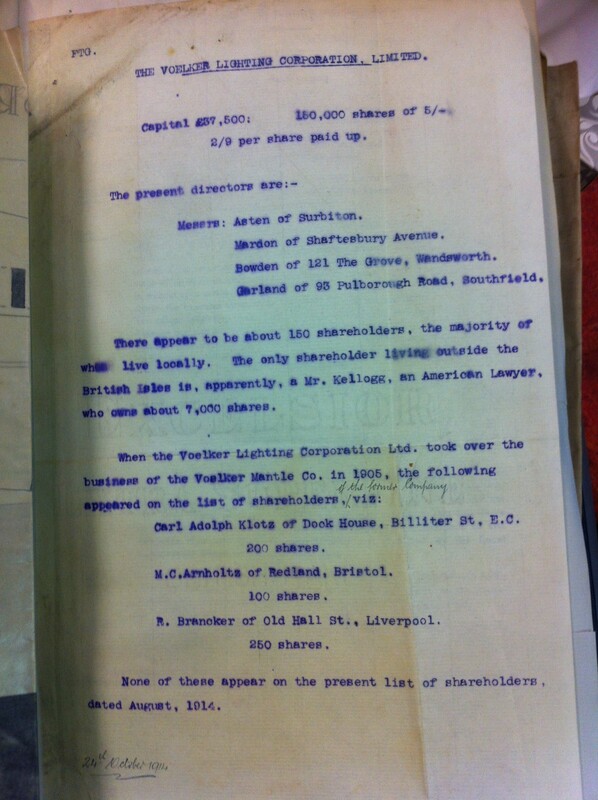 At the bottom of the document is a list of German sounding names who were on the list of shareholders when Voelker Lighting Corporation Ltd took over from Voelker Mantle Co in 1905, and an assurance none of them are currently on the shareholders list. When was the name changed? An article in the Wandsworth Historian from 2006 suggests it was early 1916, a view backed up by the rate books. Below are three entries in the Wandsworth rate books, the first is for the six month period ending March 1916, where the company appears as “Voelker”. The next entry is September 1916, and if you look carefully then you can see that the “E” has been scored out. By the March 1917 book, “Volker” is used. The rate books point to the name being changed as early 1916, and further evidence is found in the Wandsworth Borough News of January 14, 1916, where the works are advertising for staff. 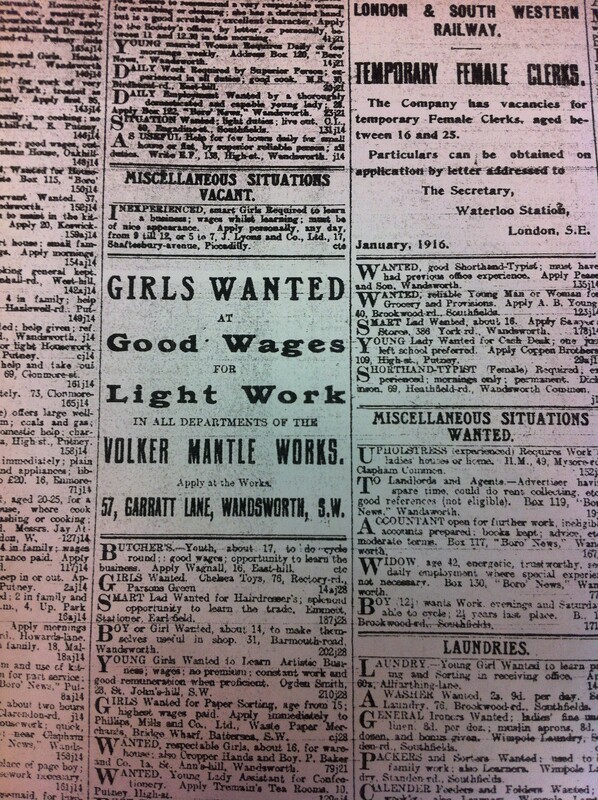 Many of the staff were female, as the image from the book Wandsworth Past at the end of the blog shows, and the ad is for “Girls Wanted” at the Volker works. This suggests that our newly found poster might be from the end of 1915, as by 1916 adverts were out with the Volker name on them – and rate books, maps (the 1916 OS map shows “Voelker”), and Kelly’s directories just took some time to catch up. Maree Batstone’s diary entry for 23rd March 1916 begins: “Very cold, wet day, snow fell often”, and continues on to record various domestic concerns and the health of her two daughters. Her husband Walter came home at “8.30, he had been enquiring about joining a regiment, he will probably be called up on Sat or Mon and will then not be able perhaps to choose a regiment, so he had been to Scotland Yd recruiting office and another, heard that Royal Garrison Artillery men are beasts, went to Kingston to be medically ex’d but too late, talked to a sergeant there. Wonders if he will join Queen’s Westminster or London Rifle Brigade”. Maree and Walter were living in Croydon at the time, but Walter grew up in Baskerville Road, Wandsworth Common, and the family later moved back there, which is why they’re featured this week. The couple married in 1907, after a four year engagement, when Maree was 23 and Walter 26. By 1916 Walter was 35, Maree was 32 and they had two daughters, Frances and Mollie, born in 1909 and 1915. Walter was a chartered surveyor in the family firm, Batstone Bros, based in the City. In many ways, the Batstones are an ordinary family, but from the point of view of our blog they are of huge interest as they kept all their letters and diaries. Wandsworth Heritage Service has family letters for their parents, aunts, uncles and children, from the 1840s to the 1960s, including most of the letters written between Walter and Maree – first during their engagement and then whilst Walter was training and subsequently in the trenches in France. Walter went to Oxford on 31st March with the 29th Royal Fusiliers, writing: “There are 6 of us here and so far they seem very nice men. We are I believe all te tees one I imagine is a married man but am not sure. I have got bad news – we are supposed to be moving from here to Edinborough in a few days time”. In his later letters, he goes to talk more about his fellow soldiers (and to spell his location correctly), and we’ll be coming back to those and to Maree’s letters to him in future weeks. The March edition of the Battersea Polytechnic Magazine carries updates from students and former students, including the seventh edition of the Roll of Distinction of those serving. There is also an update of the roll of honour, giving details of two former students who had been killed – Victor Haskins and Thomas Turland. 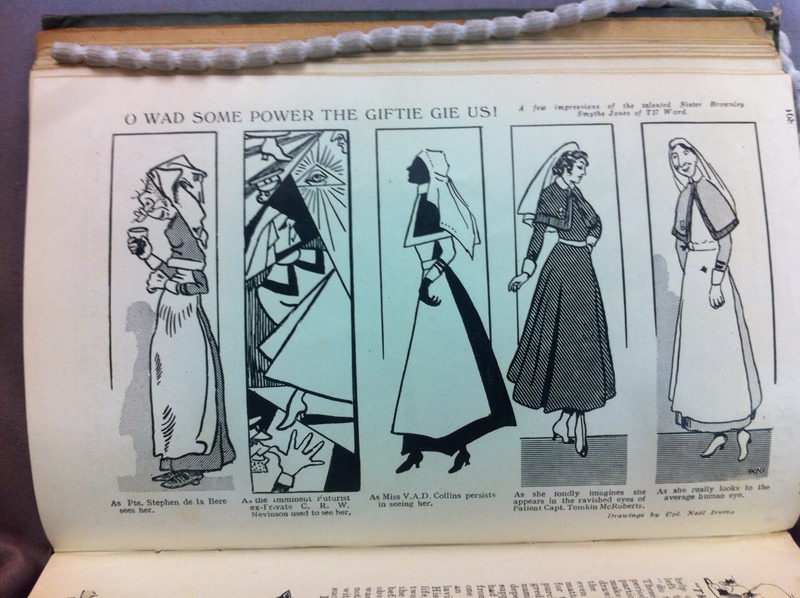 Part of the Polytechnic was the Training Department of Domestic Science, who had been actively involved in the earlier campaign to make shirts for soldiers and many of whom were now working as VADs, nurses, or in other war occupations. The magazine has a list of what former Domestic Science students were doing, it includes two who were working as “Instructresses in His Majesty’s Commisariat Department” (this seems to have been part of the Army Service Corps) and several who were working as VADs in various hospitals around the country. One of the hospitals listed was the VAD Hospital, Clapham Common. There does not appear to be a great deal of information about the hospital, it as at 9 Cedars Road but is not listed in any directories at the time. The Imperial War Museum holds a souvenir embroidery from the hospital, which is referred to as the 3rd London Red Cross Auxiliary Hospital. The Red Cross has lists of their hospitals from the war, and the Cedars Road hospital is referred to as having been accepted by the War Office through the Red Cross. More information on Red Cross hospitals can be found here. Photographs of the hospital and nurses are at Lambeth Archives and can be found on their photo page, where it is referred to as Battersea Auxiliary Hospital – showing that the name was a bit variable! The student who was based there was called M Holman. The Red Cross have lists of VADs online, including several M Holmans, but we haven’t been able to match their records to a VAD who was at Cedars Road. Several others were at the First London General Hospital in Camberwell, which is also where Vera Brittain served initially so for an account of life as a VAD in London you might want to consider reading Testament of Youth. On 26th January, the meeting of Wandsworth Borough Council received a deputation from the Clapham and District Fabian Society and the Clapham branch of the Women’s Freedom League. The reason behind this was the ongoing ban on lending fiction and juvenile [by which they meant children’s] literature from Wandsworth Libraries. Mrs Corner, representing the Women’s Freedom League, also spoke in support of the re-introduction of lending fiction, “from a woman’s view”. She backed up Mr Kettle’s point about what young women were reading, and said that “they were at an age when what they read mattered much” – reading cheap novels meant they were “developing a taste for bad literature just at a time when they should be developing a high standard of morality”. She clearly felt that women were particularly at a disadvantage due to the ban, as she further pointed out that “The novel to a woman was what a pipe was to a man” and that the ban was not currently necessary – “if the time should come when it was absolutely necessary for them to be deprived of it [fiction], they would not make any protest”. The Council agreed to look again at the ban, and at their next meeting decided to keep it in place. They had saved £572 from the book buying fund in the year ending March 1916, as well as £190 on bookbinding and £168 on staff costs, so in the interests of economy the ban was maintained. Further representations were made in June by the Putney Municipal Alliance – only to be declined again. Fortunately, fiction became available again after the war.